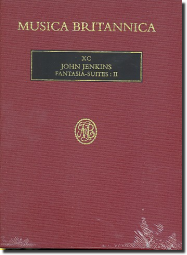 Adding to the corpus of music by an outstanding English 17th-century composer, this collection includes the fantasia-suites for treble, two basses and organ by John Jenkins (Group III in the Viola da Gamba Society's Thematic Index of Music for Viols). Though it is impossible to date these pieces precisely, the abandonment of the galliard third movement in favour of the corant suggests a provenance later than that of the fantasia-suites in MB78. The virtuoso writing of the 'divisions' is among the most demanding of all English consort music, and each of the nine suites commences with an extended fugal section as elaborate as anything found in the composer's viol fantasies – that of the seventh being undoubtedly amongst his finest works. Also included are the 29 surviving bass parts of the Divisions for Treble and Two Basses (VDGS Nos. 1–29).